India ink is a black pigment generally made from fine soot with a binding agent. The upside of India ink is its use in the art world to create drawings, comics and calligraphy. The downside of this form of ink is its use for homemade tattoos. The availability of India ink makes it a popular choice for those who want to tattoo the inexpensive way. Home tattooing is not safe and can lead to infections and serious illness. If you want a tattoo made with India ink, many certified tattoo artists will be able to help. With proper application and safe handling, India ink adds an intriguing look to body art. The care of most tattoos is the same, regardless of the ink. Cover the tattoo for at least five hours. This bandage will be put on by the person creating your tattoo. The bandage should stay in place for at least five hours, but less than 12. Wash your hands thoroughly with soap before removing the bandage. Grasp the gauze on one corner and gently pull it away from your body. Dispose of the bandage. The tattoo will not require covering at this point. Clean any blood or ointment off the surface of the tattoo with a hypoallergenic soap. Apply a small amount of soap onto your fingertips. Do not use cloth on the tattoo. Gently wipe soap over the tattoo. This might be messy, so if possible, hold the tattoo over a sink. Let water run over your skin until all the debris and soap come off. Do not hold the tattoo under the water for more than 10 minutes. Dry the area with a clean paper towel. Apply a thin layer of a vitamin A & D ointment or cocoa butter on the tattooed skin with your fingers. This prevents the tattoo from scabbing over. Repeat the cleaning and ointment procedure for three days. Add additional ointment if the area feels dry, and clean off any seepage by washing or dabbing the tattoo with a clean paper towel. Moisturize the area with a hypoallergenic body lotion beginning on day three or four. Continue to apply the lotion twice a day for two weeks. Do not pick or scratch the tattoo while it heals; doing so will open up the skin and spoil the design. It may also introduce infection. Talk to the tattoo artist before having the procedure done and go over the aftercare instructions. If the tattoo becomes inflamed or bright red, see a doctor. If you begin to experience flu-like symptoms or run a fever, seek medical help as soon as possible. Itching and blistering may be signs of allergic reaction and require treatment. Do not go back to the tattoo parlor; go to a doctor. 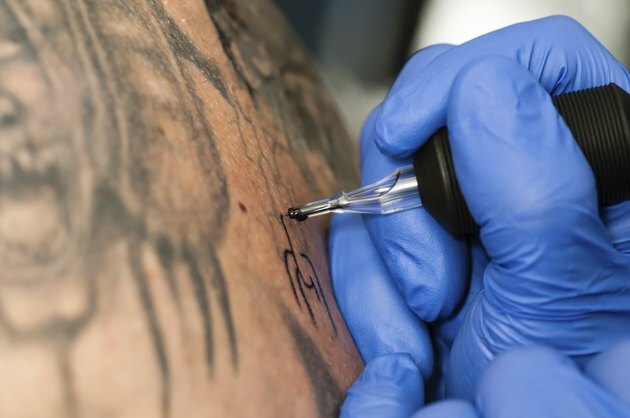 U.S. Food and Drug Administration:Think Before You Ink: Are Tattoos Safe?